A lane in the heart of Rome, Castel Sant’Angelo just a little more than 100 meters away, the street of antique dealers (via dei Coronari) within a stone’s throw, and St. Peter’s Basilica, Piazza Navona and Piazza Farnese within a few hundred meters. This is Antiqua, a 17th century residence that is ideal for a holiday in the old town centre of Rome. When walking out the main door of Antiqua, you immediately find yourself in the midst of the fascinating atmosphere of papal Rome. Long narrow lanes bordered by aristocratic palazzos. Public establishments of all kinds: from old trattorias and elegant restaurants to sushi bars and old-fashioned cafés. And workshops that keep the most ancient crafts alive, passed down from father to son: marble cutters, leather goods dealers, goldsmiths and restorers. And just a little further down the road, on the other side of Viale del Lungotevere, is the golden Tiber River with the pier from which you can take a boat for a ride down the river. Furnished with antique furniture, terra cotta floors and coffered ceilings, “Antiqua” consists of a large double or queen-size bedroom, one single bedroom and one double bedroom, one bathroom, an equipped kitchen (dishwasher, oven, refrigerator, espresso coffee machine), a living room with a sofa seating three people, and a spacious dining area. It can accommodate 5-6 guests. My husband and I spent three weeks in this cozy three bedroom apartment. The location was perfect for walking to all the historical sites. There are numerous shops and cafes within one to two blocks. The apartment was clean and relatively quiet considering we were there over a busy holiday. The hosts even decorated for Christmas! Quite modest, but comfortable. Easily reachable from all important historic places. Hosts are friendly. Pack lightly for this place which is up 3 steep flights. I appreciate your review. I'm sorry that you had a hard time with the stairs, as it is well outlined in the description that the apartment is located on the third floor of a building without elevator, something quite common if you want to experience the city center of Rome, it's hard to find building with elevator. I'm also sorry that you found the decor to be poor, because actually it's all antiques with a high value and they date from the time when the building was built, i.e. the 17th century. Great location - Vatican, Forum, Spanish Steps, Pantheon, Coluseum, and countless museums within easy walking distance or by super easy to use public transportation. Very happy with our choice. We stayed in this 3-bedroom apartment (Antiqua) for a week and loved it. 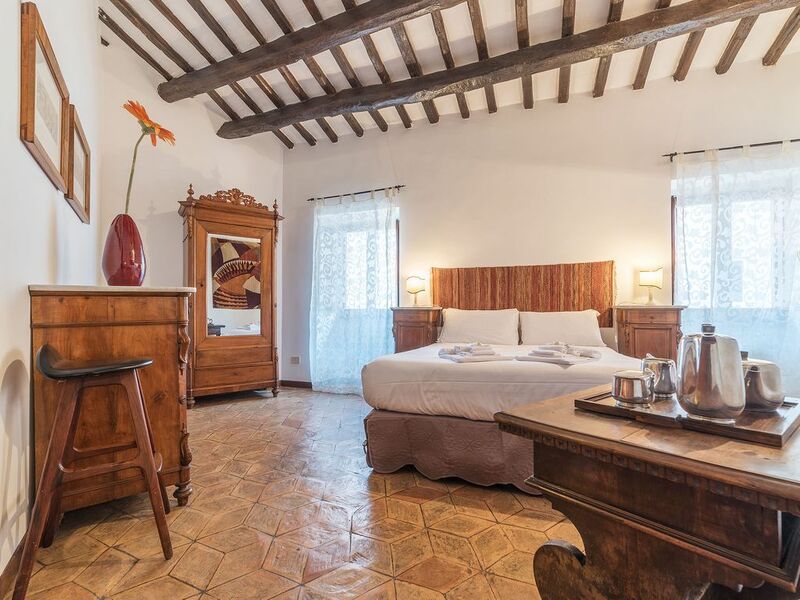 Very comfortable and in a great location off the Tiber near Castel Sant’Angelo. Less than half a mile from St Peter’s Basilica, Piazza Navona and the Pantheon. Still walkable, but a little farther away was the Coliseum, the Forum, Trevi Fountain, Spanish Steps and the Vatican Museum/Sistine Chapel. The apartment is on a quiet street with cafes/bars within steps or well within walking distance. Being near the Tiber River, we woke to the sound of seagulls many mornings. Emanuele and Marta are both a pleasure to work with and any issues were worked immediately. The apartment has much needed air-conditioning and WiFi along with a full kitchen. Highly recommend! Rome, as you have never seen it before. The river Tiber will let you discover the ancient heart of the City. You will sail from Strangely dock towards Tiberina Island continuing then up to Risorgimento Bridge. This is your opportunity to re-study 2750 years of history. Boarding: Ponte S.Angelo. Cruise time: 1 hour and 10 minutes. Price a person: €12. On board of the Agrippina Maggiore, the queen of Battelli di Roma's fleet, you can enjoy a different night dining at the River Café. The traditional and tasty cuisine, the elegant and friendly atmosphere, the musical background, are the ingredients for a special night, with the complicity of Rome by night. Boarding: Ponte S.Angelo Cruise time: 2 hours and 15 minutes. Price a person: € 54. Included: 3 hour Segway rental, 30 min orientation session, 3 hour professional guide majored in art, history and languages, headphones so you can comfortably listen to your guide. Ponchos in case of rain. Smoking is forbidden. Price doesn't include the city tax (€ 3,5 per person per night for a max of 10 days) - Guests needs to pay it in cash at their arrival in Rome. For check-in between 10 pm and 11:30 pm a 30 euros fee will be required. For check-in after 11:30 pm a 50 euros fee is due. Check-out within 10.30 am. Until confirmed, rates are subject to change without notice.